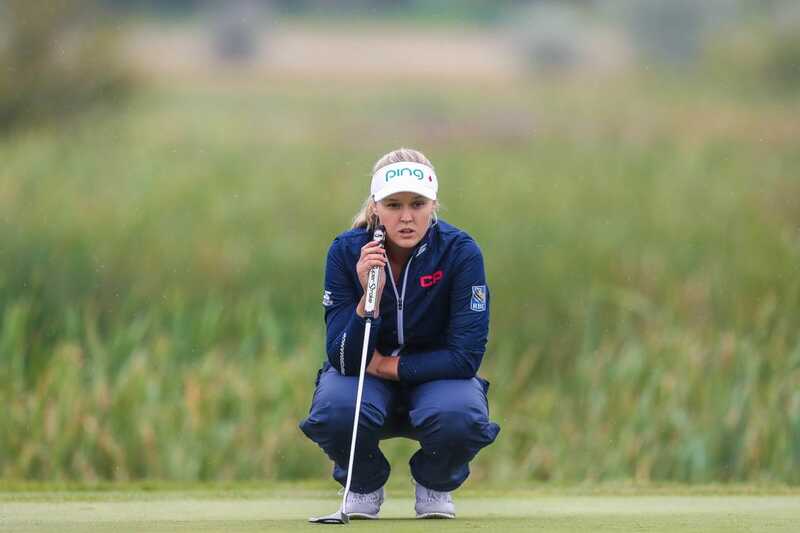 Canadian Brooke Henderson birdied five of her last eight holes Thursday for a 6-under 65 and a share of the first-round lead with South Korea's Eun-Hee Ji in the LPGA Tour's season-opening Diamond Resorts Tournament of Champions. The elite 26-player field competing at the Four Seasons Golf and Sports Club in Lake Buena Vista, Fla., is made up of LPGA winners from the last two seasons. After a bogey on No. 2, Henderson made the turn at 1-under and then birdied Nos. 11-13 and Nos. 15 and 17 to finish strong. She needed only 25 putts in the round. "After that bogey, I was like, 'Uh oh, I need to get things going,'" said Henderson, who's currently ranked No. 9. "Made a nice par save on the par-3 next hole and after that I started making a lot of birdies." Henderson and Ji, who completed a bogey-free round, are one shot ahead of Lydia Ko of New Zealand and Stacy Lewis. Lewis is competing in her first event since giving birth to her first child last year. World No. 1 Ariya Jutanugarn, the reigning LPGA Player of the Year, is two shots back after firing a 67. She is tied with Mirim Lee and Lexi Thompson. Four players are tied for eighth after carding rounds of 3-under 68: Annie Park, Danielle Kang, Mi Hyang Lee and Thidapa Suwannapura. Twenty of the 26 players finished at even par 71 or better.